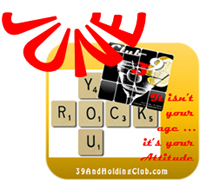 39 and Holding Club: Roses, Pearls and the Summer Solstice – June Magic! Roses, Pearls and the Summer Solstice – June Magic! All riiiiiight June 39ers! We get a day this month just for us! Well, for those 50 plus. June 21st is Baby Boomer’s Recognition Day! It falls on Father’s Day this year, so we’re splitting the fun. Of course, if you’re a dad and a June Boomer – party on! The rest of you can sip an after-daddy evening cocktail with your best Boomer buds. And if you're in that in-between stage, 39er-not-Boomer – well, it's all good. For added glow, Baby Boomer Recognition Day coincides every year with the Summer Solstice. More reason to party! Start with a bouquet of roses for the table centerpiece … perhaps one for each “bud.” Ar-ar. Yep, the quintessential rose is June’s official flower. Add Mardi Gras strands of faux pearls, the June adornment preferred by the Roman Empire. Cool trivia: the iridescent bauble even had its own “pearl age” during the 1500s in Tudor England. … Shazam! In walk fellow June 39ers, Morgan Freeman and Meryl Streep! Chatty Gemini Freeman (06/01/37), is talking Streep’s ear off in spirited conversation about Descendants Day (June 28th) and what personal (not famed professional) legacies they want to leave, when Ms. Streep (the sentimental Cancer Crab, 06/22/49) notices your fragrant roses – and, gasp – they ask to join you! Everyone’s talking at once, enjoying the party when the piped music begins to celebrate International Surf Music Month with “Surfin’ Safari”! It was released as a single in June 1962. Perfect timing, with Love and Mercy, the new The Beach Boys movie about Brian Wilson, debuting Friday, June 5th, and Mike Love’s revitalized Beach Boys’ upcoming appearance June 25th at NorCal’s Sonoma-Marin Fair. Of course, this fictional scene will never happen … certainly not, if you stay home on your birthday, June Gemini Twins (05/21 – 06/20) and Cancer Crabs (06/21 – 07/22). You can be closet hermits – but NOT on your birthday. Do something special! Join the 39 & Holding Club!